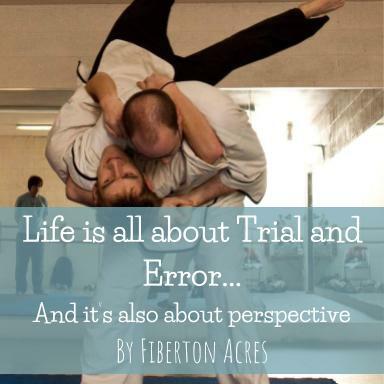 Fiberton Acres Blog: Life is All About Trial and Error...And it's all about perspective. Life is All About Trial and Error...And it's all about perspective. I have to say trial and error is, for me, the best way to learn anything. When I started Kung Fu class I sucked. I fell every time I tried a high kick, I missed every take-down, and I couldn’t land a joint lock to save my life…literally. One night after class I was sitting in my car thinking about quitting to save myself the embarrassment of constant failure, when my instructor, Brian, knocked on the window and I opened the door while trying to not look depressed. That night is when I changed my perspective on failure. I no longer fail at anything. I successfully find ways that a technique does not work. When my RV wouldn’t start after parking at a gas station in Wyoming, I checked the batteries, they worked. I checked the wires leading to the ignition, they seemed funny and something looked loose, so I attached it to an open spot on the ignition and it almost instantly melted. I honestly thought about giving up…. We’d already replaced the radiator and the sending unit for the temp gauge. But then I thought about how I had eliminated a possible problem. It wasn’t that loose wire… you know, because of the fire and all. I called my dad and we walked through the entire ignition situation over the phone, tracing wires and even replacing and MacGyvering a few connections until we got it working. Ashley and I drove off the next morning, not having failed to leave the gas station in under 24 hours but having learned how to rewire the ignition system of a 1986 Winnie. Every time you lose and fail remember that you learned. If you give up you don’t learn. Brian encouraged me to take Tai Chi, hip hop dance, and even take up parkour to improve my Kung Fu, and it all helped. I also met some of my great friends because of these side projects. If I had given up that night in my car I wouldn’t have met some of the greatest people in my life. People who see not roadblocks but parkour obstacles to be vaulted over and mastered. I want you to remember that you become a master of life only after finding every way that your life doesn't work for you, because all that’s left is the good life. If you are moving to becoming the you that you want to be, you are a blackbelt at life.